Rodney Hatfield, a.k.a. Art Snake, grew up in Kentucky in a working-class family. Though fine art itself may not have had a prominent place in his formative years, folk art, music and the art of living abounded. Hatfield’s childhood was rich with diverse characters and lifestyles, adding fuel to his already burning fires of imagination. Music was his first love and has long been a big part of his Hatfield’s life. Late nights spent blowing blues harp on stage with his band for the last three decades has added to his sense of rhythm and appreciation of colorful people. The lyrical sensibilities and humor cultivated as a club musician are evident in his work as a painter. Flowing brush strokes, multiple layers and overtones, and hard-edged scratches are all visible in his paintings. Hatfield is self-taught, which is to say he has gathered information from many sources including his own. 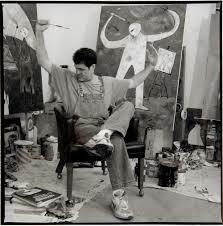 He credits the works of Marc Chagall and Joan Miro as early inspirations. Other artists that have inspired include Paul Klee and Rufino Tamayo. The juxtaposition of the shy performer, the philosopher and joker, the visionary and the guy next door can all be seen when one takes the time to look beneath the surface of Hatfield’s work. His paintings are original and unique. Figurative and abstract. Hatfield seems comfortable finding, discarding and regaining a new personal balance point with each piece he creates. He sees his work as a collaborative effort, allowing what wants to emerge, to reveal itself through him onto a waiting canvas, delighting and surprising both himself and the many collectors who have come to appreciate his loose and uninhibited style.